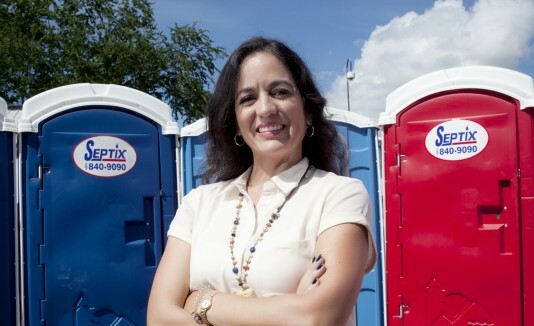 Septix has the largest selection of portable restrooms for construction and special events, including portable potties, restroom trailers, special needs units, shower units. We pride ourselves on providing the most professional and personalised service in Puerto Rico. These restrooms rentals are ideal for construction projects and industrial use. The standard in portable restroom rentals for special events. This VIP rental is recommended for weddings and upscale events. This ADA Compliant restroom rentals have extra space for handicap individuals and great for families. 6 feet high, step in front of toilet, nice pastel colors. Perfect for any event that includes children. VIP Interiors including wooden floors and walls, black ceramic sink and toilet, electric hand dryer and radio/CD Player. Affordable restroom trailer suitable for smaller crowds in any occasion where restroom facilities are needed. Elegantly appointed with amenities of a bathroom in a fine hotel or restaurant. Perfect restroom trailer rental for wedding and VIP events.Include a separate Handicap or Family Restroom. Elegantly appointed with amenities of a bathroom in a fine hotel or restaurant. Perfect restroom trailer rental for wedding and VIP events. Great for large crowds, extended periods of time or special events, hotels, pharmaceuticals and other facilities. Hand Washing Sinks are available in 2 or 4 station models. Holding Tanks are ideal for construction sites, office trailers or for other bulk waste storage needs.